The Energy Department’s SunShot Initiative recently announced up to $17 million to support the development of innovative, cost-effective solutions to boost the amount of solar energy that utilities can integrate seamlessly with the national power grid. This funding will help utilities develop adaptable and replicable practices, long-term strategic plans, and technical solutions to sustain reliable operations with large proportions of solar power on the grid. It will also support projects aimed at improving the lifetime and reliability of solar modules and electronics. The funding is being offered through two opportunities. The Solar Utility Networks: Replicable Innovation in Solar Energy (SUNRISE) funding opportunity is making up to $12 million available for projects to enable utilities to develop long-term strategic plans that integrate high levels of renewable energy generation, while ensuring reliable real-time power system operations. Funding is also available for projects to provide technical assistance and build capacity for the planning and installation of utility-scale photovoltaic (PV) systems. The application deadline for the funding opportunity is April 24, 2013. See the SUNRISE solicitation. 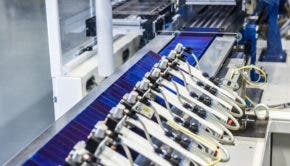 Also, the Physics of Reliability: Evaluating Design Insights for Component Technologies in Solar (PREDICTS) funding opportunity is making up to $5 million available for projects aimed at improving the lifetime and reliability of PV modules, concentrating solar power (CSP) components, and the electronic hardware used to operate and connect to the grid. The funding covers two topic areas: identification, evaluation, and modeling of intrinsic failure mechanisms in PV and CSP subsystems and system components; and development of standard testing procedures for the lifetime of microinverters and microconverters. The application deadline is April 29, 2013. See the PREDICTS solicitation and the SunShot newsletter for more information.